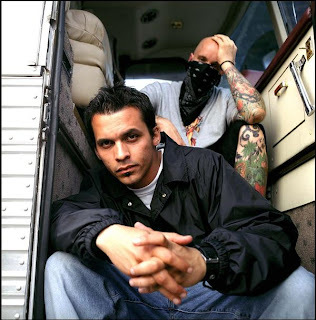 It seems like it's been a couple of years since Minneapolis underground hip-hop legends Atmosphere have made their way through town. They will be playing at The Granada on October 25th and they always put on an impressive show (no matter how weak their last couple of albums have been). If you are an Atmosphere fan and have never heard of Deep Puddle Dynamics, please check out their only album, The Taste of Rain...Why Kneel? It's a true underground classic from 1999 featuring Slug (Atmosphere), DoseOne (Anticon, Clouddead, Them, Subtle), Sole (Anticon), and Alias (Anticon). Also, if you're in Lawrence tonight, fellow Rhymesayers artist P.O.S. will be playing at The Bottleneck.